The Nightmare Before Christmas Bone Daddy Spinner Luggage | Nerd Much? 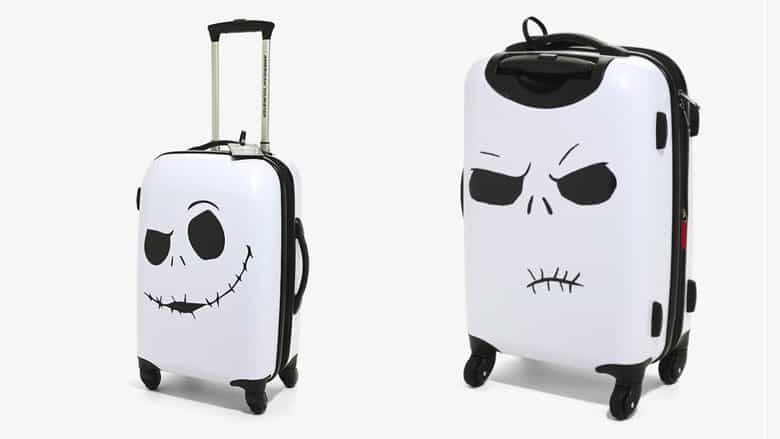 The Nightmare Before Christmas Bone Daddy Spinner Luggage is exactly what I want when I travel anywhere. My kids love it as well and it sort of has become a competition when we travel about who gets to use the Jack Skellington case, but I am usually the one who wins. The luggage is absolutely gorgeous with a nice, clean and white plastic shell. It’s not a smooth plastic either. It has a very nice textured feel to it making it feel like a premium item as most smooth plastic tends to feel a little cheap. The white color might be a bit scary at first, just like Jack, but as long as you take care of it, it should be easy to keep clean. The best part is the fact that the double-sided design means you get Jack’s face twice. The design is very minimal and striking. The fabric inside of the case doesn’t have Jack, or any of the recognizable Halloween Town characters, but instead a sort of thorny vine pattern. I don’t recognize the pattern from the movie, but it still totally fits, and the grey color of the fabric is a nice contrast to the outside of the case itself. As a fan of The Nightmare Before Christmas, I take the looks of stuff like this very seriously. The case is, overall, exactly as described. The case has those bumpers on the side and it zips up well. Normally zippers can be a bit of a problem, but that doesn’t seem to be the case here. The handles are nicely put together as well and the sliding extending handle retracts and expands exactly as you’d expect. I was particularly impressed with how roomy things felt inside of the case, even with the dividers! Definitely worth a buy for you and your little monsters, but it’s okay if it’s mostly for you.